The NC Leg of the Wings Unseen Book Tour is Taking Flight! I lived in Durham, NC, for eight years, and it’s where my writing career got its start. So I am glad to be able to share such a wonderful career milestone with my NC community of friends and fellow writers. And there is plenty of opportunity to join us and to check out some of the great voices living in this great area of the South. Join me (and Vesperi!) and local NC authors Mur Lafferty (John W. Campbell award winner, author of the Shambling Guides 1&2) and James Maxey (author of the Dragon Apocalypse novels and much more!) in reading from our works. From dragons to invisible flesh-eaters to murder mysteries in space, our trio offers a little bit of everything sci-fi and fantasy. More details: Facebook or the Regulator website. At this event, I’ll be reading from Serra’s point-of-view, and fellow authors Margaret S. McGraw and Natania Barron will be sharing stories from their own Weird West and early 1900s paranormal tales of adventure. More details: Facebook event or the Flyleaf Books website. Join myself (and a reading from Janto’s POV) and Tony Daniel, author of the Wulf’s Saga series from Baen Books for an afternoon of YA fantasy storytelling and book signing. This event is part of the B-Fest celebration of Teen Books at Barnes & Noble nationwide! More details: Facebook event or Cary Barnes & Noble website. I hope to see you at any one of these events next week, Triangulars! 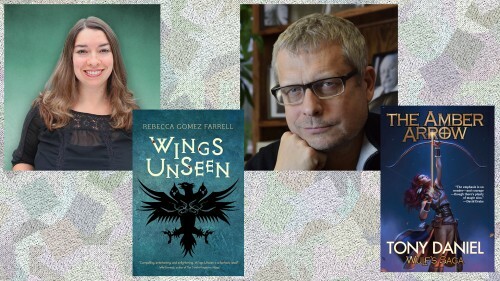 I’m looking forward to celebrating Wings Unseen’s release with the East Coast and all the wonderful folks and friends I met while living there. There will be more events coming up in October for me in the Bay Area – including a workshop and panel discussion at ConVolution! – and I’ll be sharing information on all of those opportunities to meet up soon. ← Reading at Shades & Shadows in Los Angeles 9/16!